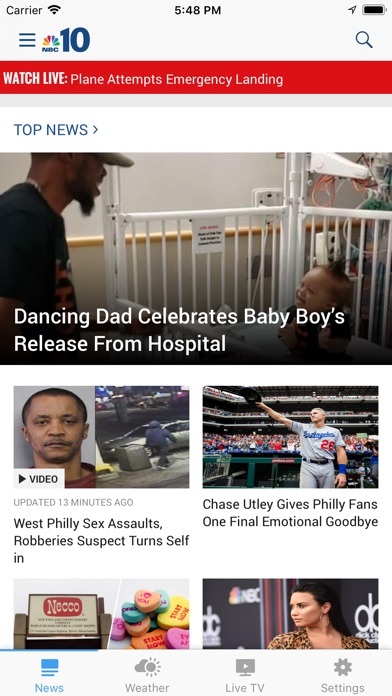 The NBC10 Philadelphia app connects you with top local stories and weather, breaking news, live TV and investigative journalism. NBC10 FIRST ALERT WEATHER + Exclusive live StormRanger10 mobile tracking radar + Forecasts from First Alert Weather Team for your region + Weather alerts based on your location + 10-day forecasts & hourly forecasts +Complete school weather closings NEWS ALERTS & VIDEO + Personalized news alerts + 3D touch news widgets on lock screen + Watch live NBC10 newscasts, NBC shows and streaming content + Watch video while you read the story I-TEAM INVESTIGATIONS & MORE + Award-winning NBC10 Investigators stories that get results + NBC10 Responds fighting to recoup consumers’ money This app features Nielsen’s proprietary measurement software which will allow you to contribute to market research, like Nielsen’s TV Ratings. Please see www.nielsen.com/digitalprivacy for more information. NBC offers accurate information. I enjoy seeing the camaraderie between the reporters. The app is easy to navigate, bright and clear. Always current with accurate and up to the minute information and news! 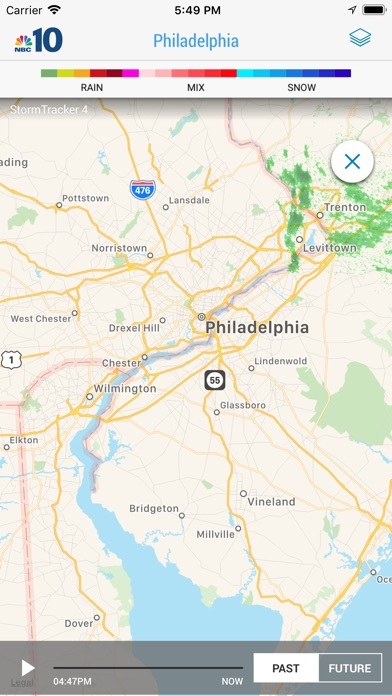 I enjoy this app for their good coverage of Philadelphia area news and weather. I also have the NBC 4 NYC App. As expected, there is an overlap in national news between the two apps. Easy layout to follow. I am updating my review because this is my go to app when I want broadcast news from a Philly and south Jersey. I have been using this app for a few months, easy to use. Apparently I’m supposed to have a Facebook account and an Instagram account to access all of the stories on the app. I have neither. This app is part of my morning routine that I look forward too. The comprehensive coverage of local and national news is presented along with inspiring stories of people and events across our nation. Great way to start your day! I am very surprise how the TV ten app keeps up with the news channel. I really enjoy it very much. If you want the best news team on your phone wherever in the world you are then this is the app for you. Download it. Hi he NBC10 app is my go-to for quick news updates in the morning before I head out to work. Thanks for keeping me relevant. Very easy to use and quickly get the facts so you can plan your day. Great for checking news and weather quickly. Great tv anchors and weather people, they seem like real people. Could have more international news, we are not in a bubble in the United States, but trying to be in one gets us nowhere. We need the cold hard truth about our messed up world and how what we do impacts the rest of the world. Things, such as we need our immigrants to help our economy with so many seniors here and not enough young people to keep us going. Every night, someone should be tough about our environmental status. I am old an on my way out, what happens to the children and not just the ones here! ....,. I do not think Craig M adds much if anything. Having him join SG and HK at 7:10 am is just not necessary or even welcomed. I don’t get him. He seems uninformed and not able to notice or respond to social cues. Easy to load and to use. Good videos. I Love the NBC10 app. It keeps me informed about every important newsy thing that is going on and other things that I really need to know. I know what’s going on with the weather, traffic, and special events in the Philadelphia Area. It goes with me everywhere I go. I would not want to be without it. I am very informed and satisfied. By the time that either the weather or traffic information loads, the weather or traffic will have changed. Not to mention, ‘Hurricane’ Schwartz’s weather forecasts are often dubious at best.... News stories (like all TV stations though) are curated by 10 year olds...so if you need news, go to WaPo, WSJ, or elsewhere. And if you want traffic, within a minute, go to a Maps app. First, when I searched for “news” on my iPhone the NBC app didn’t even appear as a suggestion. CBS and other news apps did. Then, after I typed “NBC” in my phone’s search bar, I opened the app and saw “watch live.” However, when I clicked on that button it took me to the App Store to download the app. But since it’s already downloaded, the button said “open.” However when I clicked “open” in the App Store it brought me to another page with a picture of Jimmy Fallon on an iPad, and an image of an iPhone along with yet another “open” button- that did not work! It was all so confusing that I don’t even remember how I finally got to the live stream. But here’s what happened then. Two commercials preceded the live stream, which is annoying in itself. The first ad ran fine but the second one seemed slow. Then finally, the live stream came on and it was a story that I wanted to hear. Except, that wasn’t going to happen. The sound lagged and cutout the whole time. I caught the gist of the story but that’s all. It was frustrating to say the least. I even closed the app and reloaded it only to have the same thing happen again. It’s a shame because I like NBC10 in the morning. It’s my favorite station to watch. I enjoy getting informed by Vy, Tracy, Bill, and Jessica. It starts my day. And it just would have been nice this morning to watch on my phone and not wake anyone up (who might not have gotten a good night’s sleep last night). Instead, I’m quietly writing this review about my disappointment. This app is great! Keeps me completely up-to-date on what is happening in the world around me! I travel a lot for work. This app allows me to keep up with news happening at home. Great app. Lots of information and great notifications. Very easy to use. The hottest breaking news delivered to my phone before I can read it on Facebook or see it on the news! This app makes it easy to access the news and weather when I need it. The update has only made it even better! This has been my go-to app for several years. 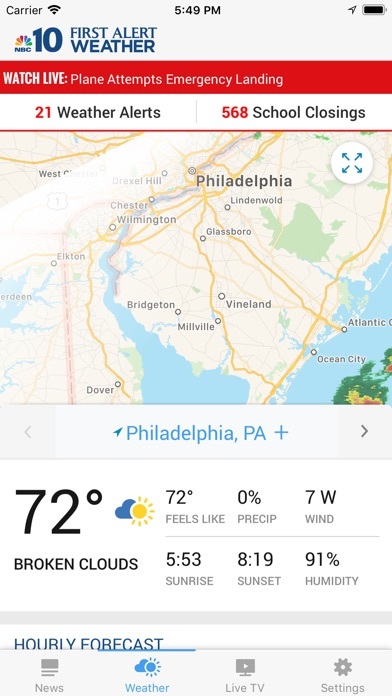 I’ve tried other weather apps and I keep coming back to this one because of the detailed weather radar tracking, alerts, and precipitation graphics. Love the local mews stories too! 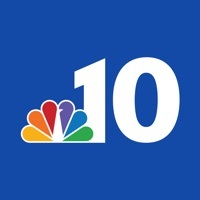 The NBC10 app gives current news, traffic, and weather quickly and efficiently. Not bad to navigate. Easily configured to put you persistent topics on top. Credible source of information. I really like using it. I like the NBC10 mobile app - anywhere I am I can count on up to date notifications on local and national news, 24/7. I LOVE THIS APP IT KEEPS ME INFORMED ON REAL TIME EVENTS AND THE WEATHER IS JUST SIMPLE EVERYTHING. I WORK AT NIGHT AND IT JUST GIVES ME EVERYTHING I NEED TO KNOW FOR MY JOURNEY HOME. Living in NJ we are between two huge cities so must depend on their news coverage to get NJ news. Nothing wrong with NY or Pennsylvania or Delaware but we depend on news from outside our state broadcasts. 10 NBC app provides a good amount of coverage we must have. 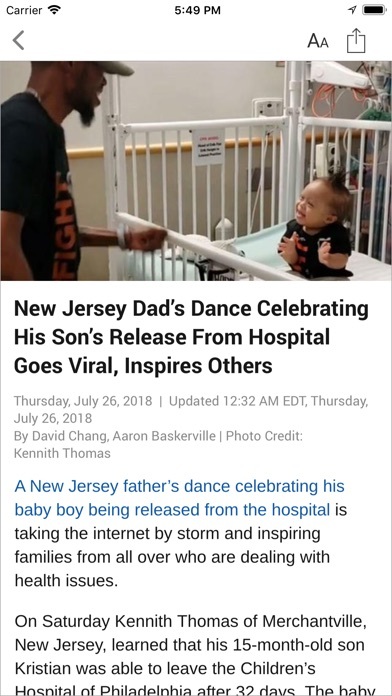 Thanks to all who have contributed to NJ part of your news coverage. Keeps me updated on all my philly news. Moved to Florida but I miss the real news of NBC10! I watch everyday on the APP! I absolutely love this app! I stayed connected to all the most important events, and the traffic alerts. The app description states that the app provides live streaming. There is no mention that live streaming is not supported for over the air (OTA) customers. Because it doesn’t support OTA customers, I’ve deleted the app. This app is Very informative, current and relevant. I absolutely love it. News on the go.